Last week when I attended the Selfridges event, it was actually snowing in my part of the country. So as a theme I decided to try and do some simple snowy/icy nails! 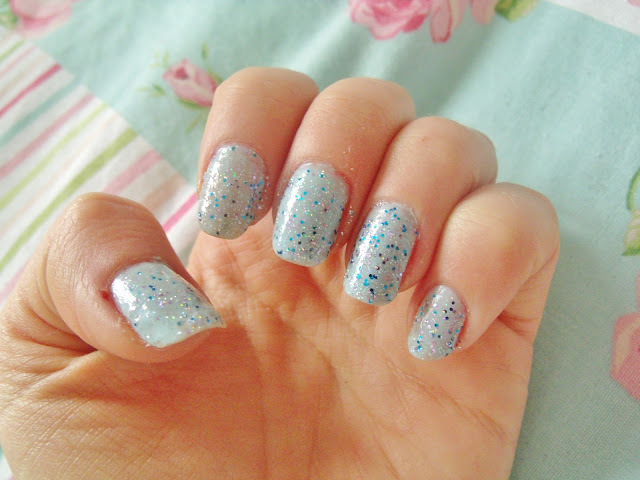 I used only two nail polishes; Barry M Blue Moon and Miss Sporty Transformers Sparkle Touch. I actually did my nails on the train to Birmingham which was a bit of a disaster as I kept smudging them.. but hopefully they don’t look too bad! Anyway this glitter nail polish is probably my favourite! It has tiny bits of silver, blue and purple glitter, and then also some larger pieces. The colours mixed together are so gorgeous and winterish. And do you want to know how much it cost me? £1.99! You can buy this from Boots or Superdrug for less than £2! 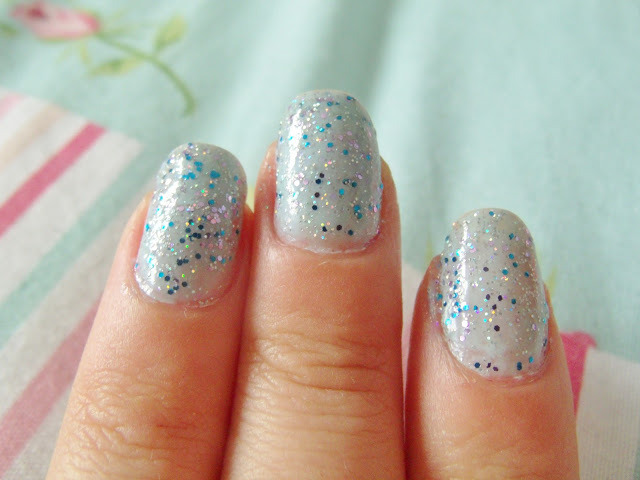 The gorgeous pastel blue base is Blue Moon by Barry M, which is really shimmery. It’s a gorgeous colour, and is only £2.99. I think the two polishes go really nicely together for a winter wonderland nail look. Pretty! I need to wear blue/green/mint nail polish more often!